Home Canning FAQs: Hot Pack or Raw Pack; Which is Best, and Why! Hot Pack or Raw Pack? Which is Best in Home Canning? Many canning recipes and directions specific processing times for "raw pack", "hot pack" or both! What is the difference and how do you know which method to choose? Raw Packing - also called "cold packing"
Raw-packing is the practice of filling jars tightly with freshly prepared, but unheated food. Such foods, especially fruit, will often float in the jars. The entrapped air in and around the food may also cause discoloration within 2 to 3 months of storage. Raw-packing is more suitable for pickles; since pickles require minimal processing due to the very high acid content, and the need to retain the crispness of the raw vegetable. It is generally also used for vegetables processed in a pressure canner, since the additional time getting up to down from pressure ensures plenty of cooking time. Hot-packing is the practice of heating freshly prepared food to boiling, simmering it 2 to 5 minutes, and promptly filling jars loosely with the boiled food. Whether food has been hot-packed or raw-packed, the juice, syrup, or water to be added to the foods should also be heated to boiling before adding it to the jars. This practice helps to remove air from food tissues, shrinks food, helps keep the food from floating in the jars, increases vacuum in sealed jars, and improves shelf life. Preshrinking food also permits filling more food into each jar. Many fresh foods contain from 10 percent to more than 30 percent air. this is important because how long canned food retains high quality depends on how much air is removed from food before jars are sealed. 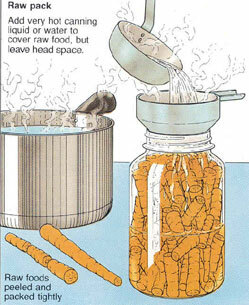 Use the hot-pack method, especially with acid foods to be processed in boiling water rather than a pressure canning method. The Raw pack method is fine for pickles and for vegetables to be processed in a pressure canner. If you are still not bored, here's more information about hot packing v. raw packing! 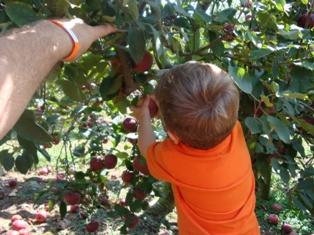 The offering of hot and/or raw packs is usually based on quality issues with the finished product. However, USDA process recommendations have been developed over time by different laboratories and researchers. Sometimes it has been the choice of the researchers who developed the process recommendation to only use one method. Individual food characteristics can also lead to the need for specific preparation procedures. For example, in a hot pack process for a starchy food like potatoes, the food is precooked in water that is then discarded (some of the starch is drawn out into the water) and replaced by fresh boiling water when filling jars. If a raw pack process was chosen for the same product, the starch that now cooks out in the jar may later gelatinize and/or cause excessive cloudiness in the finished raw pack . This amount of starch in the jar also causes safety concerns during the canning processing, and makes it hard to detect any post-processing spoilage in the stored jar. As another example, many pickled products are hot packs because the pre-heating starts to acidify the food before it goes in the jar and results in a safer product. Why are hot and raw pack processing times sometimes the same? Hot pack and raw pack variations, as presented on pickyourown.org are derived from USDA recommendations, which have each been researched separately by the USDA. This includes collecting heat penetration data and calculating an independent process time for each. So the process time is determined by the actual heating characteristics of the pack. Depending on preparation procedures and the type of process, the final result may be the same. Other times, it might be different. The temperature of the process (boiling water or pressure) and the length of the process needed can influence the differences between hot and rack pack rates of heating. 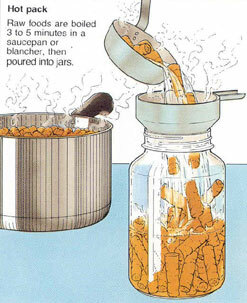 Another consideration is that USDA home-canning processes are rounded off to the next higher 5-minute interval. If the hot and raw pack process times vary by less than 5 minutes, but in the same interval, the recommended process time will be the same. For example, if the hot pack is calculated as 11 minutes and the raw pack requires 14 minutes, they will both get rounded off to, and published as, a 15-minute process time. This is to avoid the possibility of underprocessing, and the potential for harm that would bring!